Luvuyo Rani, the eldest of four brothers, of whom two have passed away, was born in Queenstown in the Eastern Cape in 1974. He stayed with his mother who was a domestic worker and father who was a male nurse. When Luvuyo’s mother had become unemployed, the family had decided to turn their home into a shebeen in order to gain some form of income for the family. This was the first time Luvuyo had been exposed to entrepreneurship. His mother had taught him everything about the family business and in doing so; this was how he had learned about it all. He then started selling sweets at school to bring in more income within his household, this way the family was able to survive from various incomes that came in. He never did mathematics or accounting during his schooling career. So, he therefore had options of becoming a pastor, teacher or nurse. Due to the family’s financial constraints, Luvuyo wasn’t able to continue with his education within a tertiary institution. He had no option, but to remain at home for an entire year, which was tough and had exhausted all his confidence. In 1996, Luvuyo decided to move to Cape Town. He traveled with a taxi and eventually stayed in Harare in Khayelitsha; hungry for education and opportunities which would enable him to grow and gain stability for himself. He then decided to apply at UWC to study Broadcast Science, but they were unable to accommodate him, as there wasn’t any space left for the course even though Luvuyo had outstanding schooling results, which included exemptions. This setback did not discourage him instead it kept him going. Luvuyo then approached Pentech asking for career assistance and they offered him a course in horticulture. He could not accept the offer, as he had known nothing about horticulture. CPUT (Cape Peninsula University of Technology) then offered Luvuyo a bridging course, which included accounting and business economics. 1997, was Luvuyo’s first year of university. Although this was a great accomplishment in his life, it was also a really trying time, as his father had passed away. This challenged Luvuyo, as he had no idea where the funding would come from for his long awaited university journey. With his remarkable academic results, Luvuyo was then offered student funding, in order for him to pursue his desire for education. He then started working in Cape Town at a call centre to generate more income and also handed out flyers at the Waterfront robots and worked at the customer services department of the Aquarium. Later he was then given an opportunity to work at Bishops where they offered to pay for his B-Tech studies. Due to the environment and culture Luvuyo was exposed to he could not keep up and decide to become a teacher in Khayalitsha. He was then teaching accounting and business economics and continued to do so while completing his studies. He spent three and a half years being a teacher, which he considers to be the most memorable time of his life, as he believes teaching, is a noble calling and would possibly be interested in returning at some point in the future. While teaching in 2004, Luvuyo unfortunately still felt financially restricted and found himself in debt. Although he had a car and two-bedroom house, he still had to support his mother. Life was tough for him. He then made a brave decision to resign from teaching. Along with his brother, the Director and Co-Founder of the company, Luvuyo began, in the community. His brother, Lonwabo Rani, assisted him by getting R10 000 worth of financial assistance from the bank in order to purchase computers to resell to schools. Eventually, Luvuyo’s house and car was repossessed as he had missed payments due to the lack of no income. This motivated him to focus on selling refurbished computers to schools. Educators thought he was crazy to leave the teaching profession, in order to sell computers back to them. But, this worked out very well for him and his brother, as the business grew rapidly. It was a ‘fight for survival’ business, as funds had come in, but needed to go out again in order to maintain the demand of the service they offered. The business name was then finally changed to “Silulo Ulutho Technologies” (the letters of the four brothers were incorporated within the business name) meaning “we bring value”. Soon enough every school in the community was able to receive computers and due to high demand within the schooling industry, the brothers realized that training needed to be offered alongside the computers being sold to various schools. Finding space to open up the business was a struggle as the required funds were hard to reach as Luvuyo was blacklisted. The business continued running despite this setback. On the 15th February 2006 the Rani brothers opened up a café. Later in 2007, a training school was then opened. Silulo Ulutho Technologies, established in 2004 with its head office situated in Cape Town, South Africa, a pioneering information communication technology in emerging and rural communities with operations in Eastern and Western Cape. We embody the renowned hard work and dedication of a proudly South African black owned company that is driven by Technology, Accessibility, Empowerment and Education. The joint strength of our nationwide network of branches, enable us to bring Information Communication Technology to the doorstep of previously marginalized communities. This has ensured that we remain at the forefront of the ever much needed ICT infrastructure to inspire, educate, develop and empower communities. The secret to our enduring success is the constant commitment and drive to service excellence, product development as well as the consistently reliable and trusted high quality standards, which our loyal customers have come to expect. This vision has ensured that we remain at the forefront of our industry and committed to being one of the country’s leading suppliers of ICT who are continuously bridging the gap in access to ICT, skills development, skills transfer and education. The Silulo concept revolves around three central ideas—Technology, Knowledge and Empowerment. Technology enables communication and collaboration across communities and across boundaries; Knowledge is the result of the will to learn and the wish to grow beyond your own limitations; Empowerment is the notion of equipping individuals and the community with the necessary skills to fulfill their potential. Silulo is dedicated to inspiring others to empower themselves through technology and knowledge. Be a partner of choice for NGOs and private sector organisations to access the township market. The Internet café provides a location for various segments of the township population to access computers and the Internet. Furthermore, it provides a venue for business services including business cards as well as design and printing of marketing materials, obituaries and invitations. Further services include copying, faxing, printing, scanning, binding and laminating. The café’s high traffic location in the malls situated in townships, attractive pricing and a broad product and service offering attracts residents of all income brackets and market segments. The café provides the core benefit of easy and conveniently accessible solutions to the distinctive needs of various consumers. Silulo Ulutho Technologies is a one-stop shop IT company that provides public computer courses that are accredited by MICT SETA. Nowadays it is vital to have an understanding of how to use computers—it is simply part of life for any person in the 21st century. Whether you want to be a scientist, develop the latest killer application, or just know what it really means when someone says, “the computer made a mistake”, studying a short computer course will get you there. What works for one person will not necessarily work for someone else, and of course, anyone can change their mind on what they actually want to do in their career. This is all the more reason to dedicate some of your studies to computing. By improving studying one of our computer short courses and increasing your computing knowledge you will be more employable and provide you with a foundation of knowledge, problem-solving and logical thinking that will serve as a competitive advantage to you in your career, in whatever field you choose. Silulo Business Incubation Centre offers an opportunity to rent space in the shared workspace for the entrepreneur who needs an office that is conducive to productivity and opportunity by encouraging the presence of like -minded people. 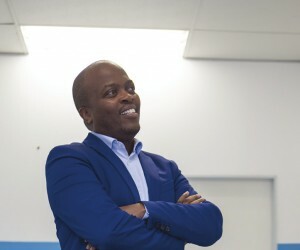 Silulo is offering 18 entrepreneurs the opportunity to rent a space in their shared co-working space at the Silulo Incubation Centre in Watergate Mall, Mitchell’s Plain, Cape Town. Selected entrepreneurs will have access to the following: - a dedicated receptionist - a desk in the shared co-working space, office chair and lockable drawers - Wi-Fi access - ability to book and rent out the meeting rooms/ boardroom available on site - invitation to training and networking events.